Today I presented an overview of Yaghnobi grammar at the U of O Linguistics Colloquium. I have uploaded a copy of my handout for the colloquium here: Overview of Yaghnobi Grammar. This handout is an outline of basic clause structure and grammatical relations with parsed and glossed example sentences. If you need an explanation of any part or have questions please don’t hesitate to leave them in a comment here. 6/9/07 Update: I uploaded a corrected version of the Yaghnobi Grammar Overview today. 6/17/07 Update: I fixed a typo in example 23. I changed kap to kar. Posted by Bahrom in Book Review, Linguistics, Phonetics, Phonology, Semantics, Syntax, Yaghnobi. While I was in Tajiksitan I scanned a copy of The Yagnobi Language by A. L. Khromov, 1972, Moscow. Recently, Gulruh Muhtarova has been kind enough to translate two sections for me. I have provided links to copies of all the chapters as well as the translated sections. 4/10/07 Update: bulbul has begun translating additional sections. I have added a link to the English translation of the section on adjectives, and translations of additional sections are coming! Posted by Bahrom in Book Review, Linguistics, Yaghnobi. Posted by Bahrom in Linguistics, Semantics, Yaghnobi. While I was in Tajikistan I compiled a Yaghnobi-English-Tojiki lexicon using Lexique Pro. The sources for the lexicon were written and spoken texts, as well as elicitation sessions with language consultants. 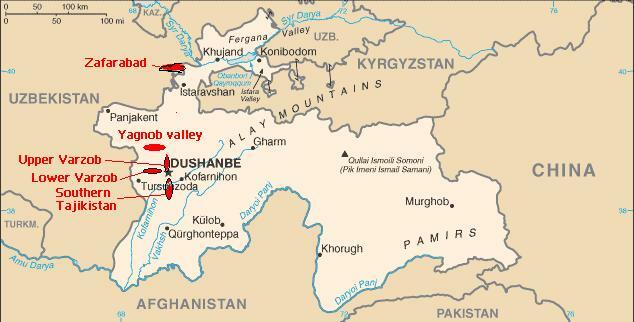 The Yaghnobi and Tajik entries are written in modified Cyrillic orthography. The pronunciation of some of the Yaghnobi words is also given in IPA. When I have time, I will add the pronunciation for more words. I put quite a bit of effort into the accuracy of the lexicon and much of it was checked by my Yaghnobi consultants, but I’m sure that there are still corrections to be made so I will look forward to any and all constructive comments.